The mid 1960s heralded in an era which saw Japanese tourists travelling abroad in substantial numbers for the first time. Prior 1964, the Japanese Government made it near impossible for the average Japanese to acquire a passport to travel overseas. As comparatively close destinations such as those in Asia and the Pacific were off limits during the earlier part of the decade, the tourism industry looked nearer to home to find an equivalent haven. Thankfully they didn’t need to look too far with the Izu Islands sporting the subtropical volcanic island of Hachijo-jima 287 kilometres (178 miles) south of Tokyo. Short travel times by ferry and a readymade airport relinquished from Imperial Japanese Navy control meant the island could quickly scale up and handle large numbers of inbound tourists. Government attempts to promote the island as the “Hawaii of Japan” resonated positively and soon the island saw a rapid influx of investment and property development. The largest among these was the lavish Hachijo Royal Hotel modelled on French Baroque architecture. Along with plaster renditions of Greek statues and ornate water fountains it stood proudly as a showcase of the economic boom taking place on the mainland. At the time of its opening in 1963 it was one of the largest hotels in Japan and attracted its cliental from the ever expanding Japanese middle class. The hotel complex was even audacious enough to embellish its then company’s president Eiji Yasuda with his own statue alongside his prized horse. Fast forward 30 years and cracks had plainly emerged. With overseas travel having become the norm rather than the exception, the idea of hanging out on black volcanic sands no longer held the same appeal. With world class beaches only a little further afield in places such as Guam, Hawaii and Thailand meant Hachijo-jima was going to struggle to reinvent itself. The hotel subsequently underwent several name changes, settling on the Hachijo Oriental Resort prior to its demise and eventual closure around 2006. Having visited the hotel site recently, it revealed a very sorry state of affairs. Even though it’s been only 10 years since ceasing operations the tropical heat and saltwater has ensured a swift deterioration of the hotel’s amenity. Compared with photos from only a few years back, the grounds are now so overgrown it’s bordering on a jungle. With the likelihood of finding a new owner quickly fading it’s a wretched sight to see this once grand hotel crumble around itself. Main entrance with roundabout out front. Hotel founder Eiji Yasuda paints a lonely figure. Empty swimming pool in rear garden area. Ornate fountain looking worse for wear. 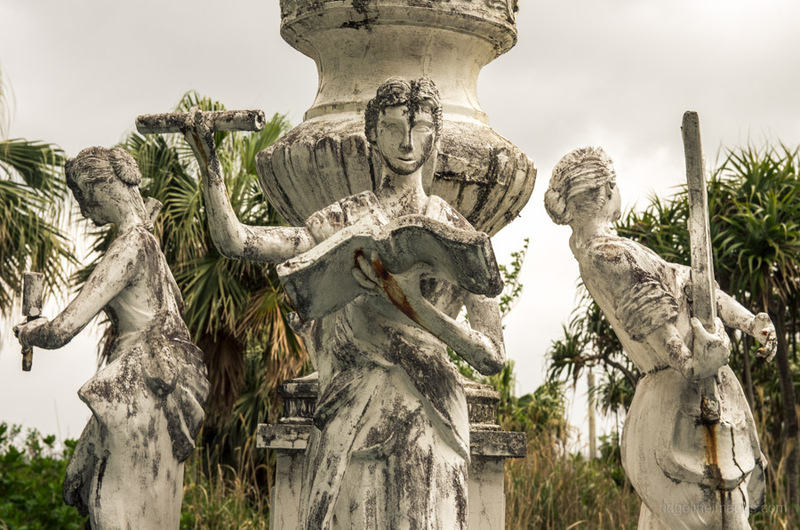 Plaster statues well past their prime. Steps leading to the outside entrance. Hachijo Oriental Resort sign struggling to be seen. The demise of the Hachijo Oriental Resort is such a sad waste. Perhaps an enterprising group could crowd source and fund its revival. There surely must be some very worthwhile uses for this building. A great story David. My thoughts exactly Brenda. It would seem an appalling waste if all the resources that went into building this stately hotel were to fall by the wayside. With Japan in the grip of a demographic crisis reviving the building as a hotel seems unlikely, but surely some alternative use could be thought up you would imagine. 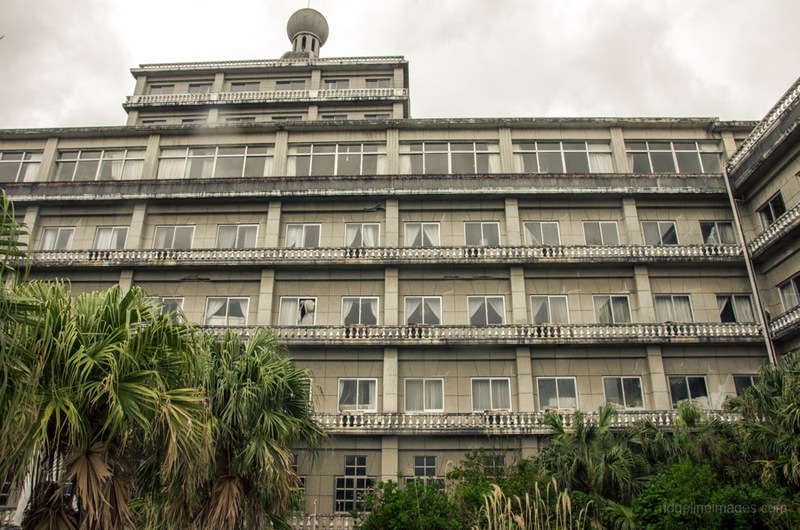 Okinawa has abandoned hotels like this all over the island. Tourism is still big business here so new hotels are still being built. That’s interesting to hear. Unfortunately for Hachijo-jima given its isolation and seasonal tourism means the likelihood of any large infrastructure investment is near zero. Still got some pictures from the hotel from better days. I actually spend my holidays there in March, 2006. Back then it already looked quite run down though. Mathias, it sounds like you were one of the last paying customers to stay there! Nice to have some confirmation that the hotel was open still in early 2006. Thank you for that and the historical context isn’t too much of a surprise. No doubt Hachijojima’s comparative isolation made it a perfect spot for a tuberculosis sanatorium. Apparently after industrialisation reached Japan it was followed by a TB epidemic in the late 19th century necessitating the construction of numerous sanatoriums. None more tragic then the Nagashima Sanatorium for leprosy patients which continued to operate shamefully decades even after the diseased had been officially cured. I just found out about Hachijojima yesterday. I found your article in a search for info about it today. Another link that turned up was this one with some more history. Very intriguing place. An older article but a good one so thanks for sharing. If you’re coming to Tokyo it’s definitely worth the effort to try and visit this beautiful island.